Ok, so that story was not entirely true. The true story of Volty is a little more mundane. 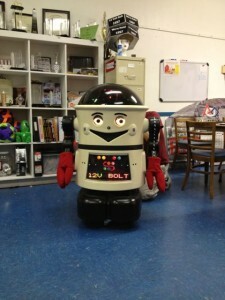 Volty started his life out as a prop used in a library where he would read stories to young children. In 2009, he retired from his life as a story teller and was graciously donated to 12VoltBolt to be used as a mascot. He has been very helpful in raising awareness about robots. He is always a big hit at the Eustis Streetfest. Crowds of kids gather around him to see what he is going to do next.